Four land purchases, and the matter of how to staff the maintenance and improvement of natural areas protected by the county, were on the June 11 agenda for consideration. A 10-year countywide millage of 0.2409 supports the natural areas preservation program (NAPP). Voters approved renewing it most recently in 2010 through 2020. This brings in about $3 million a year. The program has protected 2,254 acres, both natural areas and farmland. The Natural Areas Technical Advisory Committee (NATAC) advises WCPARC about property it might acquire for the NAPP program. In October 2008, NATAC identified the Jarskey property as a high priority for acquisition, and WCPARC first discussed buying the property at its April 9, 2013 meeting. 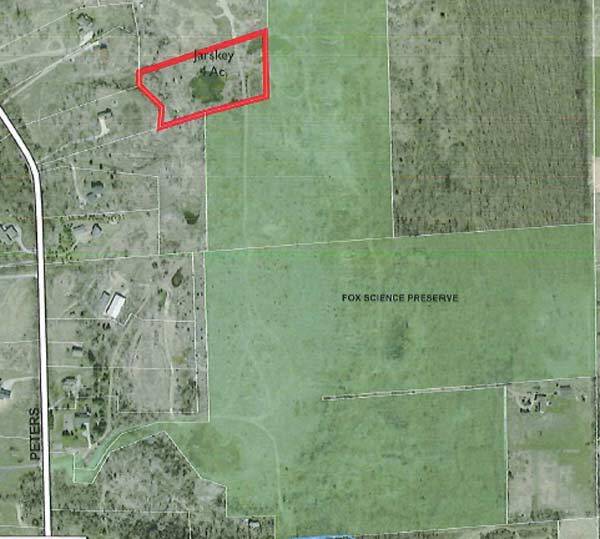 The parcel is at the northwest corner of the Fox Science Preserve in Scio Township. At the June 11 meeting, former WCPARC deputy director of Tom Freeman, now a consultant on NAPP matters, reviewed the information provided to the commission. He highlighted how the Jarskey property would enhance the value of the adjacent Fox Science Preserve, whose entrance is on Peters Road north of Miller and not far south of the Huron River. The Fox Science Preserve is one of the most popular and frequently visited preserves that WCPARC operates, Freeman said. Preservation of the additional acreage would ensure the site continues to provide a unique environmental education setting for Washtenaw County students. Scio Township, Freeman said, strongly supported the acquisition because of its high value to the community. Commissioner Conan Smith, who also serves on the Washtenaw County board of commissioners, stated his reservations about the ecological uniqueness of this purchase. “NATAC says it has ecological value, but it isn’t natural, it is man-made,” he argued. Freeman acknowledged the “man-made” concern, saying that was his first thought. But when he visited the site again, he realized how valuable the pools were. They provide a chance to talk about what lives in a pond; the structure of groundwater and why it perches at varying depths; and why water collected in these pools but not at deeper excavations. Commissioner Jan Anschuetz spoke in favor of the acquisition because of the ponds and because visitors to Fox can currently see the pools and want to visit them. Freeman added that the Jarskeys are willing to sell these four acres, but not more. In the brief silence following that remark, commission vice president Patricia Scribner called the question. A roll call vote was taken. Outcome: WCPARC unanimously authorized purchase of the Jarskey parcel in the amount of $14,285 per acre, or $57,140. 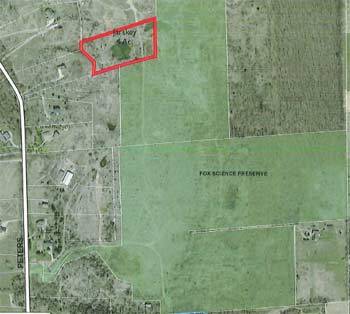 At its May 14, 2013 meeting, WCPARC gave preliminary approval to buying these three contiguous properties in Northfield Township, containing 249 acres. On June 11, Tom Freeman summarized the nature of the land, calling it a real mixture of land types with a variety of ecological and horticultural features. It gives WCPARC the chance to preserve a large contiguous habitat. The land has some slopes, a significant part of Lawton Lake, a bog, and a wetland with high islands and dry corridors, making it possible to connect all the properties with trails. The Northfield Township board is very supportive of the acquisition, especially because it is close to Whitmore Lake and would be an educational resource for the public schools. Freeman also pointed out that WCPARC has little property in this location – the northeast section of the county, right on the Livingston County border. Commissioner Jan Anschuetz remembered that when Freeman had inspected the site, he had gotten a bad case of poison sumac. Freeman said that building a boardwalk would protect the public from that. Anschuetz suggested there might be more than one access point, and Freeman agreed. Outcome: WCPARC unanimously approved the purchase of the Ramsey, Lippert, and Carr properties at a cost of $1,445,196. The next three parcels that WCPARC considered were before it for the first time formally, although the land has been in play for several years. 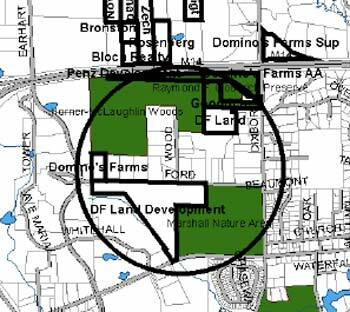 The parcels are owned by DF Land Development LLC, a subsidiary of Domino’s Farms. These three parcels – of 54, 12, and 5 acres – are in Ann Arbor Township near the intersection of Ford and Dixboro Roads. Chart showing information about potential acquisitions from DF Land Development LLC. Freeman pointed out the significance of the site’s location – immediately west of the city of Ann Arbor’s 79-acre Marshall Nature Area, WCPARC’s Goodrich Preserve, and the University of Michigan’s Horner-McLaughlin Woods. Purchase of all three of the DF Land Development properties would enable an extensive trail system to connect all of these sites. Because of this, Freeman said, letters of support for the purchases have come from Ann Arbor Township, the Huron River Watershed Council, the city of Ann Arbor, and the University of Michigan. A complex process involving the owner and the Michigan Dept. of Natural Resources Trust Fund (MNRTF) as well as WCPARC has resulted in a proposed partnership that could mean WCPARC would acquire the property for an investment of just $928,780, Freeman said. The complexity began with a difference of expert opinion about the value of the property. Bosserd Appraisal Services – used by WCPARC “almost exclusively to identify a fair market value for prospective purchases,” Freeman noted – found it worth $2.167 million. A second appraisal, by Bur Valuation Group, identified a value of $3.25 million. When MNRTF reviewed both appraisals as part of a grant application submitted by the county, the MNRTF initially decided on a value of $1.3 million, Freeman said – significantly lower than the other appraisals. In August 2012, MNRTF had agreed to provide WCPARC with 70% of the acquisition costs for this property, so the amount of the acquisition cost was critical. Freeman then described the resolution. The agreement would include a sales offer of $3.25 million. After reviewing additional sales information, and in consideration of the fact that the property is zoned residential and on a water and sewer line, MNRTF raised its valuation to $1,554,600. That means the MNRTF grant will be $1,088,220. MNRTF agreed that WCPARC could use the Bosserd appraisal to determine the NAPP contribution, and could contribute more than 30%. So NAPP will contribute 48% of the Bosserd appraisal: $928,780. DF Land Development agreed to contribute by reducing the price by $1.083 million, so that its net price would be $2.167 million – the same as the Bosserd appraisal. An as-yet unnamed partner, which has not yet formally approved participating, would contribute $150,000. Freeman’s briefing had been interrupted only a few times by commission member questions, but otherwise there was no significant discussion. Outcome: Commissioners gave unanimous approval to authorize preparation of a purchase offer for the 54 acres of DF Land Development property in Ann Arbor Township at a net price of $2.167 million, contingent upon the receipt of acquisitions funds in the amount of $1,088,220 from the Michigan Dept. of Natural Resources Trust Fund, along with the participation of other partners, completion of all necessary due diligence investigations, and the commission’s final approval. The presentation on these two parcels had necessarily been entwined with Freeman’s description of the 54 acres. Both of these parcels are almost entirely wooded with mature oaks, maples, hickories and other hardwoods, and both have steep slopes. NATAC found both to be high priority, although the Huron River Watershed Council’s bioreserve map ranks them as of medium value. The appraisal for the five acres is $100,000. Freeman said the Ann Arbor greenbelt program might be a partner in acquiring the 12-acre parcel, which is immediately south of the county’s Goodrich Preserve. The appraisal on the 12 acres came in the day of the WCPARC meeting, at $220,000. The resolution voted on by commissioners, which was prepared before the final appraisal had been completed, set the price at $215,000. Freeman characterized the five-acre proposal as solid. However, the 12-acre proposal is uncertain, as the county awaits a decision from the city’s greenbelt program. Commission discussion was again brief. Outcome: WCPARC unanimously agreed to authorize preparation of purchase offers for the DF Land Development 5-acre parcel at a price of $100,000 and the 12-acre parcel at a price of $215,000, contingent upon completion of all necessary due diligence examination of the property and the commission’s final approval. WCPARC director Bob Tetens and deputy director Coy Vaughn briefed commissioners on a proposal to manage lands that are part of the county’s natural areas preservation program. Tetens reminded WCPARC that the ordinance establishing NAPP had originally specified that WCPARC use 93% of the revenue generated by its millage for purchase of land, and 7% to maintain it. “We knew that would not be adequate for maintenance over time,” he said, so in May of 2012 WCPARC had asked the county board of commissioners to amend the ordinance to a 75%-25% balance, so that more could be spent on maintenance. A prudent and responsible approach to management requires identification of a sustainable stewardship program for all lands acquired through the NAPP millage. Without the assurance of a source of funding, the long term sustainability of NAPP, and the nature preserves it has established, is uncertain. The county board responded by giving WCPARC more than it requested: the ordinance was amended on Sept. 19, 2012, to remove any mandate on how funds were allocated between acquisition and maintenance. WCPARC member Conan Smith also serves on the county board of commissioners. Vaughn then picked up the thread, using a memo from Tetens and a separate handout to present a set of facts on the WCPARC system. Combining NAPP (2,524 acres) and county parkland (1,952 acres), WCPARC manages 4,476 acres. Of these, 372 acres of parks and 556 NAPP acres are “core conservation areas” (CCAs) under some level of ecological management. Another 1,868 acres in both categories are identified as CCAs, but not yet under management. This is one way to describe how WCPARC currently falls short of achieving what Tetens called a “sustainable stewardship program.” Some 1,868 acres need more stewardship. Vaughn described the techniques used for successful ecological management to bring habitats back into balance so native biodiversity can thrive. Those techniques include removing invasive species and reintroducing natural processes, such as prescribed fire. He then reviewed how the work is currently done: planning and coordination by a park naturalist and park superintendent, one maintenance worker, a couple of seasonal workers, and some contracted workers and volunteers. NAPP processes are also quite a burden on planning staff, he said. Each one of the dozens of annual nominations [the application made by a landowner for purchase consideration by NAPP] requires many steps, including staff support to NATAC; obtaining boundary surveys, mapping, appraisals, and environmental assessments; site visits; and, if a purchase results, other steps to complete the real estate transactions. Then there is a planning phase for each property: making maps, laying out and constructing trails, and taking site plans through township processes. Planner Meghan Bonfiglio and consultant Tom Freeman do a lot of this now, Vaughn said. A staff memo outlined the proposal to create three new positions and possibly eliminate one. [.pdf of NAPP stewardship staff memo] One new position would be a natural areas planner to do all NAPP-related planning, the work now done by several other staff members. This would consolidate all of the pre-acquisition tasks and site development work leading up to the establishment of the preserve. Another new position would be a stewardship coordinator, to develop stewardship plans for all natural areas in both NAPP and parks. Other tasks would be to coordinate the work of field crews, and expand the volunteer stewardship program. The third new position would be a park laborer, trained and dedicated to stewardship activities. A position that could possibly be eliminated would be one of two park naturalists. The stewardship coordinator would replace that position. The result would be two fully equipped NAPP crews, which would cost about $350,000 a year, twice the current investment in stewardship. This is 15% of the total natural areas budget, well below the 25% that Tetens had proposed. Commission discussion targeted not the specifics of the proposal, but the longer-term implications of the strategic decision to build an “endowment” between now and 2020 so that a millage renewal would not be a necessity. Conan Smith said he would like to see a financial plan for creating the fund, and that he was concerned that the county’s general investment return of one or two percent would not be sufficient for such a fund, which he would like to see at five to seven percent – “more like a pension fund.” Smith said he would like to see such a fund pulled out of the county general fund, and to have an independent investment policy for the fund. Dan Smith expressed concern about running into legal impediments about how to invest the funds. Conan Smith suggested creating a trust, with a board to manage the funds. Dan Smith picked up on that idea, suggesting that people could “donate land to the trust. You need better return for the idea to be sustainable.” Tetens agreed to follow-up with the county treasurer. WCPARC president Bob Marans then asked what Tetens had meant by his earlier statement that there is only so much qualified property. He wondered where it is, and how it correlates to what WCPARC already has. In response to a question from commissioner Jan Anschuetz, Tetens said that the proposed Trolz property acquisition is still not resolved, but WCPARC’s fund balance is adequate to cover the transaction, which would use both NAPP and parks funds. Outcome: Commissioners gave unanimous approval to authorize staff to prepare a board action request for the creation of three new permanent full-time positions as outlined in the staff memo. Each month, WCPARC staff provide updates to commission members about ongoing improvements to WCPARC’s facilities, and activities at parks and natural areas. At the June 11 meeting, staff presented updates on work by the Agricultural Lands Preservation Advisory Committee (ALPAC), the East County Recreation Center, as well as a range of other projects and activities. The ordinance that established NAPP also established the Agricultural Lands Preservation Advisory Committee. ALPAC serves as an advisory body to assist WCPARC in determining whether to purchase the development rights on a particular parcel, and how much the county should pay for those rights. The program is intended to protect farm or other agricultural land by purchasing development rights so that the land can continue to be used for agricultural purposes rather than being developed. This type of protection is a permanent legal status and – unlike the outright purchase of land – does not usually include open public access. The update at the June 11 meeting concerned two properties that ALPAC had recommended for protection. As described at WCPARC’s Feb. 12, 2013 meeting, ALPAC had recommended that the county first apply for 2013 funds from the federal Farm and Ranch Lands Protection Program (FRPP). The two properties under consideration were (1) the 72-acre Graichen property in Superior Township, and (2) the 190-acre Heller property in Lima Township. 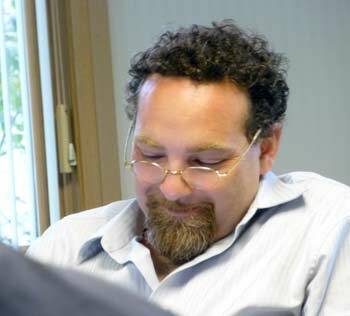 On June 11, planner Meghan Bonfiglio reported that the FRPP applications were made in March 2013, and though final notification of awards for Graichen and Heller have not yet been received, “it is reasonable to expect the paperwork finalizing the awards will be completed in early summer.” Bonfiglio said the award was likely to be in the range of $250,000-$260,000. Staff continue to work on the phase 1 environmental assessment and surveys needed to make a final recommendation, she said, and ALPAC expects to submit a final recommendation to the Aug. 13, 2013 WCPARC meeting. The east county recreation center proposal, hatched and nurtured by WCPARC, entails a partnership of the city of Ypsilanti, the Ann Arbor YMCA, and WCPARC. The groups plan to collaborate, with WCPARC build the rec center on land with a focus on the western end of the 38-acre Water Street redevelopment site on Michigan Avenue, just across the Huron River from downtown Ypsilanti. That property is now owned by the city of Ypsilanti. The center would be managed by the Ann Arbor YMCA. The most recent step was to take a public opinion survey. The Ann Arbor YMCA commissioned Four Square Research Inc., a market research firm, to do that work. There is significant interest in a new east Washtenaw YMCA recreation center: 7.2% of all households expressed a great deal of interest with all location, pricing, and facility options. The national average is only 4.5% for a full-facility YMCA. The study tested two locations: downtown Ypsilanti on Michigan Avenue at the Water Street redevelopment area, and off Stony Creek Road at Rolling Hills County Park. The downtown site was the preference of 2,334 people, whose membership revenue would total $1,528,788. Only 2,011 preferred the Stony Creek site, and they would generate $1,317,466 in revenue. There was high price sensitivity among prospective members, leading FourSquare to recommend implementing both current rates and lower branch-only rates to attract the highest number of new memberships and membership revenues. There is only limited interest in daily use as compared to annual membership. The area population to be served is largely physically inactive. While there are some existing for-profit activity providers, the area is very much in need of public and non-profit providers. There is a big service void, according to the study. A new facility should have about 44,000 square feet. There was no substantive discussion of the report. The next step, Tetens said, would be a lunch for key players, including WCPARC members, on June 25, at which the full report would be presented. Commissioners were provided with brief updates on a range of other items. The Lazy River is temporarily closed for repairs and is not able to be used by patrons. We will be using 2012 admission prices during this time. When the Lazy River is available for use, we will implement the 2013 admission prices. We apologize for the inconvenience and hope to have the Lazy River up and running as soon as possible. The old bathhouse is gone and the new ticket booth is operational. A new brochure is at the printer, and new signs at both the Rolling Hills Water Park and the Blue Heron Bay at Independence Lake County Park are installed, using a consistent blue water theme. Landscape improvements continue, working out from the buildings and parking area. The new traffic circle is done, and parking is expanded. 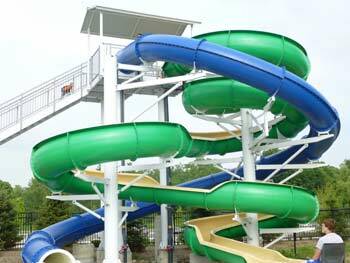 A new water slide at Independence Lake county park. At Independence Lake, a new entry is functional and the new water features – called Blue Heron Bay, in a separately fenced area with separate admission – are working. Bad weather, especially storms and the threat of storms, has kept attendance down. Special awnings protect toddlers from the sun, and the user-activated water features, such as a gigantic spider-like structure that requires six kids to work together to get the water flowing, are popular. There was a community safety day at the park, complete with fire trucks, and there will be a Father’s Day pancake breakfast on June 16. In other updates, WCPARC director Bob Tetens briefly described a new arrangement with the Washtenaw County sheriff’s office which costs about the same as the previous method – $100,000 per season – but provides more people at times they are needed. Police academy graduates will be hired as park service officers – Tetens referred to them “police officers in waiting.” They are paid on an hourly basis. There are usually two at Rolling Hills and one at Independence Lake, and they also check occasionally at nature preserves, he said. They are trained in first aid and use a sheriff’s office vehicle with a special logo on the side and orange lights rather than red. There were also several updates on the county’s Border-to-Border (B2B) trail. Work on the River Terrace Trail in Dexter is nearly done, and staff continue to work on the final 1/8 mile extension to connect the trail to the village at Central Street. The B2B extension into the Water Street redevelopment area is the subject of Ypsilanti’s revised application to the Michigan Dept. of Natural Resources, as part of a 2011 grant project, and it is under review. Staff provide several different financial reports to WCPARC each month, focused on the past month’s expenses and revenue, and the year-to-date situation. There are separate reports on parks and facilities, and on the natural areas preservation program (NAPP). Each of those units has its own, separate funding, although both are administered by WCPARC. The non-recurring major expenses report for NAPP showed a total expense of $130,267 – all to improve the Clark-Avis Spike Preserve so it could be fully open to the public. The fund balance for parks began the fiscal year on Jan. 1, 2013, with a balance of $12,950,815. Revenue – primarily from property taxes for the year – is at $6,678,953, or 68% of the budget. Tetens explained that although property tax revenue is 92% of the budget, fees and services – which will be bolstered throughout the outdoor season – are at only 25% and should quickly fill in on the revenue side. Expenses of $3,249,883 – or 46% of budget – will also increase quickly during the rest of the year. The fund balance for NAPP, which was $10,263,644, has been augmented by $2,982,377 in revenue and diminished by $2,088,497 in expenses. Although the fund balance projected as of May 31, 2013, is $12,923,998, Tetens said he expects it to be closer to $10 million, similar to 2012. There was little substantive discussion of any of the financial reports. Outcome: WCPARC unanimously voted to receive, accept and file the financial reports. The WCPARC receives reports each month on attendance at its facilities with the ability to take attendance. The reports include participation in measurable activities and revenue received. The reports include year-to-date comparisons for the prior two years. Due to malfunctioning of equipment at Rolling Hills Park and Water Park, there was no report ready in time for the June 11, 2013 meeting, but there were reports for the three other facilities. Director Bob Tetens prefaced his remarks with a reminder that 2012 was an unusually hot year, which pushed up attendance at the outdoor facilities. Rather than drawing negative conclusions about 2013 in comparison to 2012, he suggested comparing 2013 to 2011. Tetens summarized the report for the MLM rec center by saying that attendance was stable while revenue was up, and that there is an uptick in non-resident attendance. Staff will assess attendance by zip code to get a better reading. Memorial Day weather was cool so Independence Lake Park was off to a slow start, Tetens said, with attendance of 831 and revenue of $9,893. That compares to 2,021 ($20,509) in 2012 and 1,665 ($16,438) in 2011. Blue Heron Bay showed attendance of 111 people and generated $427. Outcome: Commissioners gave unanimous approval to receive and file the reports. Present: Jan Anschuetz, Janis Bobrin, Evan Pratt, Robert Marans, Nelson Meade, Patricia Scribner, Conan Smith, Dan Smith, and Fred Veigel. Next meeting: Tuesday, July 9, 2013 at 7 p.m. in the county parks and recreation department’s office at 2230 Platt Road in Ann Arbor, in the County Farms Park property.